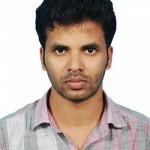 Sinu A. graduated with Bachelors in Mechanical Engineering from Thangal Kunju Musliar College of Engineering,India. Sinu joined as MS student in the Department of Mechanical Engineering, Indian Institute of Technology-Madras, under the supervision of Dr.Shankar Krishnapillai and Dr. Sundararajan Natarajan in 2015. Sinu is interested in Topological Optimization of Inelastic Structures.